This post also has information about braiding the 14-loop ‘letterbraid‘ both in the traditional manner (two braiders working together, each braiding the 7-loop Spanish braid taught here, and connecting their two braids into one as they work), and with my own solo-braider method (7 loops held in each hand). Slide the bubble under the video to the point you want to see. 5:45 Basic braiding moves, making a divided version of the braid (loops are not turned over while being moved). This creates a divided-into-two-layers braid, which will form a loop/ buttonhole at the start of the braid. 17:47 Beginning of braiding a “solid” braid: each loop is turned over when it is moved. This connects the upper and lower layers of the braid, making a solid, rectangular braid, twice as wide as a square braid. In the video I am braiding a color pattern that I call “Lopsided Crowns”. In the picture of the two sample braids below, the lowest braid has an example of the “Lopsided Crowns” pattern: At the far right (upper) end of the braid, beside the biggest bunch of loop-ends. 7-loop ‘spanish’ braids, these are pattern samplers made using bicolor loops (embroidery floss). Click 2 times to see the braid structure. This post now has instructions for making all the color-patterns in these two sampler braids. See notes below braid instructions for info on color set-up. Give all loops a half-turn when transferring them (for a solid braid), or no turn for a two-layer, divided braid (both shown in video). Other combinations will make different braid shapes. La, b, c, d = left index, middle, ring, little finger, or the loop on that finger. This is similar to most loop braiding notation systems, goes back to the 15th C. manuscripts. 1. Ra (operator finger for this move) goes through Lb, takes La and places it onto Lc. First left-side transfer done. 2. Lb shifts up to La. 3. New operator finger Lb goes through Lc and Ld, takes Rd. Second left-side transfer done. 4. Rc shifts down to Rd, leaving the Rc finger empty. Loops are now in mirror image of original starting position, ready for the 2 right-side loop transfers. 5. La (new operator finger) goes through Rb, takes Ra and places it onto Rc. First right-side transfer done. 6. Rb shifts up to Ra. 7. New operator finger Rb goes through Rc and Rd, takes Ld. Second right-side transfer done. 8. Lc shifts down to Ld, leaving the Lc finger empty. Loops are now in original starting position, ready for the 2 left-side loop transfers. For the 7-loop braid, just keep repeating these steps. Skim through notes below for info on color setup and new info on loop-turns. Most of the rest of the notes are for the 14-loop, doubled version of this braid. After you learn this 7-loop braid, check out the bicolor pattern set-ups below for several fun color patterns. To turn or not to turn: In my 7- and 14-loop braid samples, each transferred loop was turned. (“reversed” –15th C, “crossed” –Speiser and Kinoshita). This interconnects the upper and lower layers of the braid fabric. It also creates a color change if you are using bicolor loops. 2-braider method: For making either the 14-loop letterbraid, or my doubled 14-loop samplers in the traditional method, 2 braiders would be standing side-by-side, braiding from one fixed point. What I described in the directions above are the LEFT braider’s moves—the right braider mirrors everything the left braider does. For example, the right braider starts with 4 loops on his/her left rather than right hand (and would then begin braiding at steps 5-8, followed by 1-4, since these two sections are the mirror-image of each other). For the letterbraid: at the start of braiding, all the dark shanks are in upper (or all in lower) position on all fingers. The color of the upper shanks forms the ground color; the color of the lower shanks will be the color of the letters. Dan Gaiser’s flat 7-loop spanish braid. 6 bicolor loops and 1 black loop. More of Dan’s 7-loop Spanish braids. Most of these are flat (only 1 of the 4 loop transfers is turned). I think (?) the lowest braid may have the shape I teach in this tutorial (rectangular in cross-section – all 4 loop transfers turned). The upper 3 braids have the same color-pattern, but with different colors. The 4th one has a slightly different pattern. 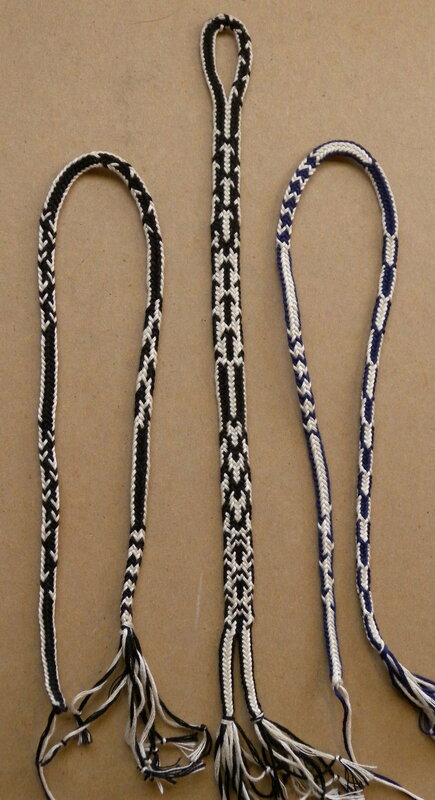 The lowest 3 braids have other color-patterns. Color sequencing: For setting up your own color arrangements, if you want to line up colors in a certain order in this braid, you’ll need to know the loop sequence (the order of how the loops follow each other in the braid itself). Two loops that are next to each other on your fingers might not actually be next to each other in the braid. I describe the loop sequence for the 7-loop spanish braid here in my post on color-pattern planning. Many other patterns are possible than just the ones I show—try other set-ups; single-color loops; and combining bicolor and single-color loops. Update: after I posted this tutorial, Gary Mitchell developed an online interactive pattern-planner for this 7-loop Spanish braid! With it, you can plan over 500 different braid designs! I’ve made two posts about his planner – the first post explains how it works, and the second post has a video showing how to follow his planner in braiding a design, either one you’ve made up, or one of the examples in my photos. See note 2b re (lack of) historically notated color-patterns. For these patterns, use all bicolor loops. When you are about to start braiding, set the loops up on the fingers as I describe below for each pattern. In the directions below, “Black” means: dark shank in upper position, whereas “White” means: light shank in upper position on the finger. (All the loops are of the same two colors). All colors will return to their starting set-up position on the fingers at the end of each pattern repeat—7 full braiding cycles—as long as you haven’t made any mistakes! The “Edge” pattern is an exception. With this set-up, the loops will return to the same color distribution on the fingers after each braiding cycle (4 loop transfers), so the “Edge” pattern repeat is only one cycle long. That makes it a good pattern to practice the braid with—you can error-check to make sure the color distribution is correct after each cycle, instead of counting 7 cycles before knowing if you’ve made a mistake. a, b, c, d = index–little finger loops. Each loop is bicolor–half light, half dark. In Gary Mitchell’s new interactive pattern-planner for this 7-loop spanish braid, the Edge pattern’s ID # is 585—if you enter that # into the box on the first page of the planner and click on “submit,” you will see a chart for this color-pattern. Start with all white OR all black shanks in upper position on all fingers. –I forgot to try doubling this pattern in a 14-loop braid. Top rightmost pattern in navy braid (sampler photo) is simply the Edge pattern, alternating with the same pattern but with all the colors reversed—switching Whites and Blacks in starting position. 2nd braiding cycle (4 loop transfers): do the first 3 transfers STRAIGHT, but the last transfer TURNED (reversed/crossed). What is a “spanish” braid, exactly??? Several braids were referred to as “Spanish” in the 17th C. English loop braiding manuscripts, not just this particular 7-loop one. Some were single-worker braids and some were multiple worker braids, and they had varying numbers of loops from five to 14. This one is the first Spanish braid I learned how to make —from Joy Boutrup and Noemi Speiser’s recent monograph—though I had read about “Spanish” braids much earlier, without really understanding what they were (in Noemi Speiser’s Old English Pattern Books for Loop Braiding). Even though this 7-loop braid is meant to be made by a single braider, the structure/architecture of the braid is very similar to the 10-loop 15th and 17th C. doubled-square braids made by two braiders—in Europe as well as other parts of the world. Surprisingly unlike the European two-worker double-square braids, this 7-loop “Spanish” braid grows on a W-shaped fell. Historically, European two-braider braids were made with what I call an “M-shaped” fell. That’s because they were braided by two braiders both using A-fell braiding moves. The other thing that might seem different is that this “Spanish” braid has an odd number of loops, while all the double braids I teach (so far) have an even number. However double braids can also be made with an odd number of loops, I just haven’t taught that variation here yet. Braiding them with an odd number of loops slightly changes the way the braider or braiders connect the two halves of the braid—they wouldn’t use a simultaneous and reciprocal loop-exchange move. At the start of braiding, one braider holds 4 loops and the other holds 3, yet each braider will (in turn) do all the braiding moves of a 4-loop braid (the way I teach square braids – the V-fell method). There are at least two ways this can happen. One way: the braider with 4 loops starts, braids two loop transfers as for a 4-loop square braid, and then passes the closest index loop over to the other braider—who’s been holding 3 loops, with none on the closest index to the first braider. Now the second braider has 4 loops. S/he braids two transfers, and then passes a new index loop back to the first worker. The exact same passage of loops can also be accomplished in another, more efficient way: The braider holding only three loops starts the braiding, and in one of the two loop transfers, goes through his/her own loops and takes a loop directly from the other braider’s closest index finger—and ends up with 4 loops. Then it’s the other braider’s turn to repeat those moves in mirror-image fashion. And since this braid only has 7 loops, it’s fine to do it that way—there’s no need for it to be a 2-worker braid. With only seven loops, all four loop transfers can easily be done by one braider. In OEPBforLB, Speiser wonders what the term “Spanish” could possibly signify, since the so-called Spanish braids were seemingly all so different – from 5 to 14 or more loops, and made by one or more braiders. So she just defines/describes so-called ‘Spanish’ braids by their weave structure rather than their method — as being plain weave, or occasionally a mix of plain weave and twill, and never all-twill. My assumption is that 17th C braiders in England used the term “Spanish” for any braid in which the braider or braiders each make four loop transfers per braiding cycle, rather than two (the more usual case). Noémi Speiser doesn’t state this anywhere in her description of “Spanish” braids in Old English Pattern Books for Loop Braiding. But from what I can glean from Joy Boutrup’s instructions for all 3 “Spanish” braids that form the three letterbraids, and from Noémi Speiser’s descriptions of the structure of the braids called “Spanish”, that seems to be thing they all have in common. Some were one-worker braids, some multiple-worker braids. But all seem to have required 4 loop-transfers per braider, in each braiding cycle. [update – Joy Boutrup corroborated this when I asked her about it at Braids 2012]. To me it seems likely that the English braiders of the 17th century gave the name Spanish to certain braids based on something special or unusual about their method, rather than that the structure of some of these braids was plain-weave, and some a mix of plain weave and twill. Either of those two structures is a necessary result if a single braider is making four (orthodox) loop transfers and using 7 or fewer loops. An all-twill braid of 4 transfers per braider would require the braider to use a minimum of 9 loops. The 10-loop double braid that I teach as a solo-braider technique is an example of this. My guess is that if a 17th-C English braider could watch someone make that braid, s/he would likely call it a Spanish braid. So then there’s the question Why did they call it “Spanish?”… Did this braiding method come to England from Spain, or maybe from even further away originally? In the few of these “spanish” braids I’ve learned, loops are always transferred “outside→inward” in direction for the component square braid-type moves (like the so-called V-fell method). This seems a little strange to me, because in England (and most of Europe), the opposite direction of braiding was always used in making square braids: loops were transferred “inward→outside” in direction – a.k.a. the A-fell method. If European simple square braids had later evolved into spanish braids—doubled square braids done by one braider—then why didn’t these braids have the typical European A-shaped fell, doubled into an M-(AA) fell? It’s perfectly possible to make them this way, in fact it’s the way I’ve tended to prefer myself after originally trying it in both directions… (it’s the braiding direction I teach on this blog in my double braid tutorials). In India, and the rest of Asia and the Pacific, square loop braids were and are made with a V-shaped fell. To me it seems possible that this 4-transfer “spanish” braiding method—even though we only have records of it from 17th C. England—actually had its origins in India or Asia, before eventually being introduced into England (maybe via Spain), sometime in the 17th C. Knitting was also introduced to England from the Mediterranean/Middle East/North Africa around that time. Diseases, ideas, spices, fabric, and technologies were being disseminated on a large global scale. [new note: Loop braiding has been documented in Asia as long ago as 3 or 4 thousand years, cf Mari Omura.] There is no mention of ‘spanish’ braids in the English loop braiding manuscripts of the 15th Century, that term only appears in the 17th C manuscripts. Parts I through IV are available separately or together. Only Part II deals with letter braids. Available from BraidersHand in the U.S., from the publisher in the U.K. Please note: The actual instructions in the monograph are very brief, with no pictures or diagrams of the moves. I suggest learning the braiding method here first! The monograph is primarily a structural analysis of the letterbraids, not an instruction manual for them. This series of monographs is a supplement to Old English Pattern Books for Loop Braiding, and it assumes that the reader already knows how to make 2-person braids, and other basic info covered in the earlier book. (More info about the Letterbraid monograph here). *2 Joy Boutrup’s set-up is slightly different from mine—she starts with a loop on the Lc finger which she later moves down to the d-finger. I start with it on the d-finger. (I do that move down from the Lc finger at the end of the previous cycle, as a loop-shifting move). This makes no difference to the braid structure, and might not be any more efficient, it’s just a personal preference. The exact way braiders in the 17th C. did the moves isn’t known–they may well have also had individual differences like this. *2b No examples of color-patterns for this braid are notated in any known loop braiding manuscript. The only known recorded information about this braid is as a doubled, two-braider structure for making letter (and other) shapes by means of a braided version of complementary pick-up patterning, a very complex color-patterning technique. However, it seems very unlikely to me that the braid itself hadn’t been known and used in its “single-braider” 7-loop form in a wide variety of ‘regular’ braid patterns before charted letter-patterns were developed for it. The particular bicolor-loop color-patterns I teach in this tutorial would be very obvious and easy to come up with for any loop-braider familiar with this braid and familiar with bicolor loops (departed bows). *3 The unequal loop transfers should be made such that the two “through 1 loop” transfers (plain-weave) are done at the outer edges of the braid and the two “through 2 loops” transfers (twill) are nearer the center of the braid. *5 Other spanish braid-shapes (flat, hollow, etc): My more recent series of tutorials on the various possible shapes of double braids apply to ‘spanish’ braids as well. Please let me know where the instructions aren’t clear enough, it’ll help others who might not ask. Leave comments / questions here, I check every day when I’m in town. My [recently edited and improved] solo braider method for the 14-loop letter braid. First learn how to use thumbs, and multiple loops on the little finger, as well as 10-loop double braids, and the 10-loop Nun’s letterbraid as a solo braider. Then the 13-loop square braid, since it also requires holding 3 loops on the d-fingers, but is a simpler braid. Also, learn the 7-loop Spanish braid above—it’s the root of this 14-loop letterbraid, so it’ll help to know those moves when you are transposing them into the same loop movements done with all 7 loops on a single hand. Practice this 14-loop braid as a divided braid first, keeping the upper and lower layers of the braid completely separate. If you can braid them so they come out as completely separate layers, you can be fairly sure you are doing the moves correctly. The letterbraids are braided as two separate layers except for the pick-up patterned letters, which connect the two layers together. Start with all dark shanks in upper position. Each time you transfer a loop, make sure it hasn’t turned over—that the dark shank is still uppermost with no twist to the loop. If the two layers of the braid keep getting connected together, you are either inadvertently turning loops (probably the thumb-loops), or are reaching the wrong way through the loops to perform the loop transfer. In either case, review my solo Nun’s letterbraid video and practice that braid, the loop movements are very similar. Lth,La, b, c, dLow, dMid, dHigh = left thumb, index, middle, ring, little finger-Low, little finger-Mid, little finger-High (OR the loop on that finger). Operator finger / fetcher – the A or B finger of opposite hand that performs the interlacing move by pulling a loop through another loop or loops. There are 4 loop transfers on each hand, so 8 altogether in each repetition of all the moves (braiding cycle). The “fetcher” (operator) fingers are the a and b-fingers of the opposite hand. The operator finger always transfers a loop from one finger to another finger – it does not keep the transferring loop, just temporarily holds it while shifting and/or other moves occur. The operating finger holds its own loop low, and carries the transferring loop high. After all 8 loop transfers are done (both hands), the dHigh loops of each hand are exchanged. (The left and right DHigh loops are equivalent to the two closest index fingers of two braiders working as a team—the a-fingers of their so-called inner hands). All 7 loops on a hand perform the same movements, in the same order, that they do when they are held across the two hands of a braider making a 7-loop spanish braid. The braider performs whatever motions are necessary to get the loop to go where it should! Before setting the transferring thumb-loop onto its new finger (the left a/index finger), shift the A-loop up to the now empty Thumb. The ex-thumb loop is temporarily held by the operator finger until that loop-shift is done, then it is set onto its new finger (La). Shift index/a-loop to the thumb as shown in my 9-loop square braid tutorial. 2nd move: Lc/left ring loop moves in the opposite direction of the first transfer, through 2 loops: Lb and La. It will end up on the index finger (after the two loops it just went through are shifted down one position to make room). Fetcher finger is Ra/right index. Warning: Bring “upward-moving” loops through the other loops in the correct orientation!–watch the first and fourth loop transfers in my Nun’s letterbraid video. For these transfers, the operator finger must reach through the passive loops from “behind” – back to front to fetch the transferring loop – same orientation used in braiding an A-fell square braid, except that the fetcher finger is on the opposite hand. “Upward” means the transferring loop is pulled towards the thumb/away from the little finger. I do this by using an “outside-around” move. I don’t physically move the “transferring” loop at all. Instead, the fetcher finger (Ra) lifts the middle of the three left d-loops, and brings it over/around the “transferring” tipmost d-High loop, then holds it temporarily throughout the following transferring and tightening moves (it will eventually be placed in D-High position of the same finger). The net result of this move is that the tip-most loop (d-High) “moves” one position toward the thumb through the middle d-loop – even though it wasn’t physically moved. The next (4th) transferred loop will travel in the opposite direction, “downward”—away from the thumb. Ok, before moving on to the 4th transfer, here’s a crucial part: Keep temporarily holding that Ld-Mid loop on the fetching (Ra) finger for a while! Use Rb (right middle) as fetcher for the next move. 4th move: Use Rb (R middle) to fetch Lc/left ring loop through the 2 remaining D-loops, then Rb temporarily keeps that transferring loop during the following loop-shifting and tightening moves. (After that the loop will end up as the new middle d-finger loop (Dmid). Fetching Lc through the two Ld loops feels awkward at first, but your hands will get used to it. The two ‘left’ loops that are being temporarily held on Right A and Right B are stretched away from, and tightened against the rest of the left loops on the left hand. Stretch the two hands apart to tighten all the left loops. You are already temporarily holding two left loops, one on Ra and one on Rb. Now use the tippy-tip of Rb to temporarily hold yet another loop: the outermost loop on Left d, so the lowest loop on Left d can shift up to (vacant) Lc (L ring). Set all 3 temporarily-held loops of Right B and Right A onto the Left D (little) finger, as one move. Left-to-right: tip-most Right B, then next Right B, then Right A. They will end up as Ld-Low, Ld-Mid, and Ld-High, respectively. This can be done in one simple set-down move. Repeat all moves in mirror-image for the right loops. Finally, exchange Rd-high through Ld-high, give a slight tug to tighten. I do two main tightening moves in this braid, after the 4th transfer of each hand. I only do a slight tightening, just a little tug, after the final loop exchange. I keep my eye on the fell – the just-braided section — every time I tighten, and adjust the tightening accordingly. The letters have a tendency to slip into a slant one way or the other if you don’t keep an eye on the braid when tightening, and do it with conscious attention, rather than automatically. If I need to re-tighten after the final loop exchange, I tighten first the left and then the right loops. I lift the left d-loops off the left d-finger (using Right index/Ra) and stretch the two hands apart, then replace the loops. And repeat in mirror-image with right d-loops. This braiding method is cumbersome to write out but not to do, after you are used to it. It amounts to two pairs of braiding moves on each hand: a ‘down’ and an ‘up’ transfer with the outer loops, followed by an ‘up’ and a ‘down’ transfer with the inner loops; then a tightening move, then the same thing done in mirror-image on the other hand. The last move is the loop-exchange move between the two hands (d-high little-finger loops are exchanged, right loop through left). As I noted above the main tightening move should not be after the loop-exchange, but after the left loops are braided and then again after the right loops are braided. [Note: inner and outer loops: Turn both hands palms-up to display the loops. Inner loops are towards the little fingers; outer are toward the index/thumbs. Usually also applies to the braid itself – outer loops represent the outer edges of the braid, inner are near the center of the braid. Leave a note below or send a mssg thru my contact form if you are trying this braid and want more details. Btw, there are always other ways of accomplishing the same loop movements! I used to do them slightly differently than I described above. You may find a way that works better for you than the particular method I use. Thumb, A – Dmid, Dhigh of both hands (equivalent to the A and B loops of all four hands of two braiders co-operating as a team). If the correct shank color is already uppermost, you don’t turn the loop; if it isn’t uppermost, you do turn it. Only the loops in 8 of the 14 positions on the hand are turned (or not turned) when following the charts. If you are a team of two braiders, each braider only has to turn (or not turn) 2 loops of each hand in following each row of the chart. For my solo method there are 4 loops on each hand to check against each charted row. See full copyright restrictions and permissions at the bottom of the sidebar (if you are on a small device, the ‘sidebar’ may appear somewhere other than at the side of the screen). Hi there, is this braid possible starting without ends? I also don’t get how you do 7 bi-colour loops, because if you fold 3 you get six bi-colour loops but then you can only add a single colour for the 7th? To make that single “odd” bicolor loop: Start with a length of dark and a length of light, each length TWICE as long as you want your loop to be plus a tad extra for the knot. (Actually, each length should be exactly the same length as all your other double-length threads that you will be using to make loops to fold in half.) Then, split each length of floss in half lengthwise, so that each length is half the normal thickness. This is very possible to do with floss, it is meant to be divisible, as some embroidery requires very fine threads. Fold one of the thin dark lengths in half, thread a light thin length through it and fold IT in half, so the two lengths are linked around each other at the top. Tie the ends (all four of them) together at the bottom. Since each length was only “half-thickness” to begin with, they now are full thickness after being folded in half. So you have one singleton bicolor loop that has no knot at the top, just a knot at the bottom of the loop. When you include it with the double-length loops, it will get firmly locked into the braid after a few braiding moves. There’s a diagram of this “linked loop” on fingerloop.org, they call it a “departed bowe”: http://fingerloop.org/patterns.html#ns1 . Look at the two images just above and just below the words “Method 1” on their page. For the workaround I’m describing, you would start with two strands that are half as thick as the other strands of your loops. Ok, if your threads are NOT divisible: In that case, I make one single “odd” bicolor loop, and I make sure to leave two long ends at the top of it…I tie the knot at the top as a slipknot, leaving a few inches of end-length. After the braid is done, I pull out that slipknot at the top, and then (if I want) I can thread the two ends onto a needle and sew them into the braid to hide them. However, Dominic recently told me that he had to use one loop that was twice as thick as all the others in a 10-loop letterbraid, and that the resulting braid looked fine (that was for a different reason, I think he need 12 strands at one end for a fancy knot of some kind?) Anyway, it may be that even if your thread is NOT divisible, you could try making a linked bicolor loop without dividing the strands first — it would be a double-thick loop, and see if it made any difference to how the braid turned out. In this blog you comment that you make a 14-loop braid with 3 loops on your d fingers and that you do 4 exchanges on each hand – what’s your secret to this? 1st. Get comfortable using thumbs as well as fingers. 3rd. Learn how to braid holding 2 loops and then 3 loops on the d-finger. (It doesn’t matter which order you learn no.2 and 3…) At that point, you’d be able to learn how to braid double braids of 12 to 18 loops. After that you could put it all together with the 14-loop letterbraid. It’s basically two 7-loop double braids side-by-side. 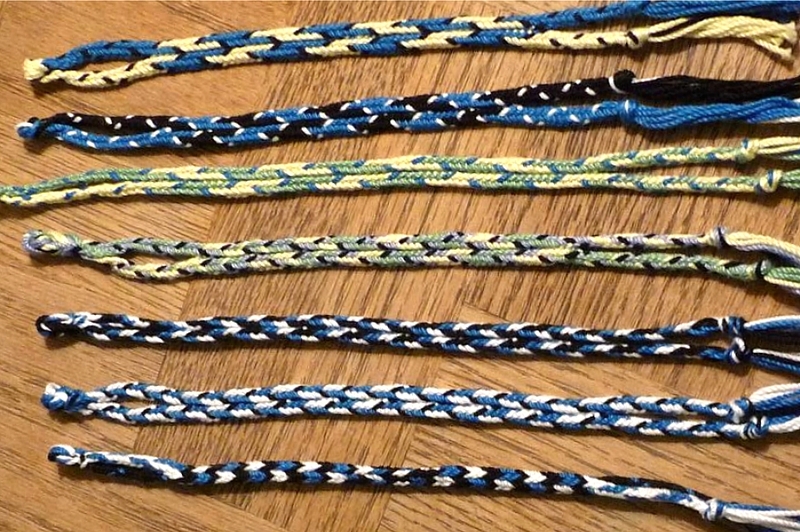 Each hand holds all the loops of one 7-loop Spanish braid. The other hand’s A-finger performs the loop transfers (and helps a bit with the loop-shifting). 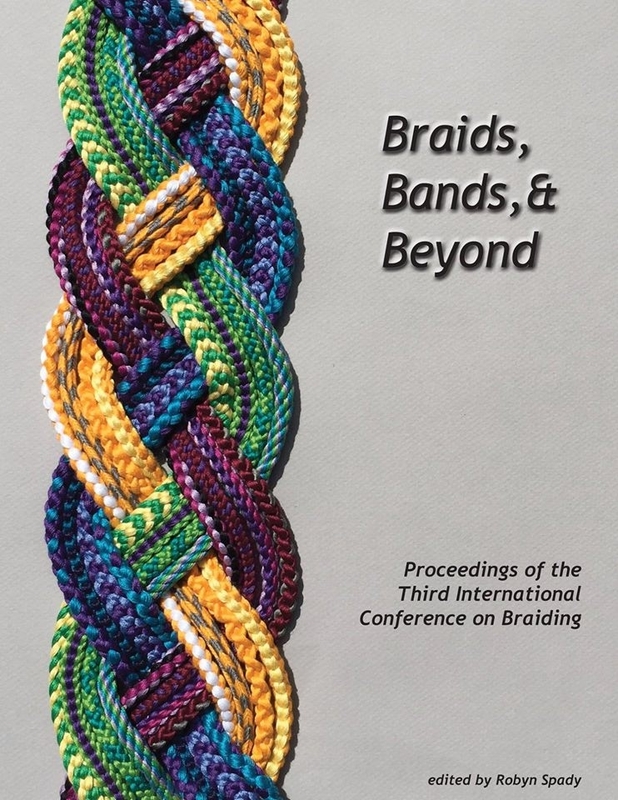 However, there are two other letter braid methods that require only 10 loops–both are described in Joy Boutrup’s book (as 2-braider methods). You could learn my solo-braider method for those right after step #2, since you would only be holding one loop per digit, no doubled or tripled loops. Btw, all three steps are fun and rewarding in themselves—they represent a lot of great braid possibilities aside from the letterbraids! If you have already made 9-loop braids, I’m sure you could learn this stuff pretty fast, but it will be a while before I can tackle writing up those tutorials. I can teach you in person, if you are ever in the San Francisco bay area (California). To form the letters you would also need to get Joy Boutrup’s book—whether you make them with her 2-braider method or my solo-braider method you would use the same charts—there’s one for each letter. Firstly, what a marvelous blog! Secondly, i have been asked by a friend of mine to make a fingerloop braid incorporating a bird-shape (her last name is Crowe) and I don’t want to disappoint, any suggestions? Skill-wise, the most I have worked is a 9-bowe lace, but I understand the theory of multiple bowes per finger, so as long as it’s not 18+ bowes, I should be OK.
Hi again, Doug–do some of the braids in my recent post look like they have bird-patterns to you? They are all 8-loop double braids, no thumbs, just one loop on each finger…Only occurred to me after I loaded the picture that 2 or 3 of the patterns looked a bit bird-like.